As you know by now, my husband and I have a New Year’s Resolution to try at least one new restaurant in the L.A. area each month. (“New” being defined by “new to us” not “just opened.”) Back in August, we actually tried two BBQ places two days in a row. Now, my husband’s from Texas, and every time we go there, we have amazing BBQ, so these restaurants are being held up to pretty high standards. That said, we have yet to find anywhere in L.A. where we think the BBQ is as good as it is in Texas, and we REALLY wanted one of these places to be our new go-to place. 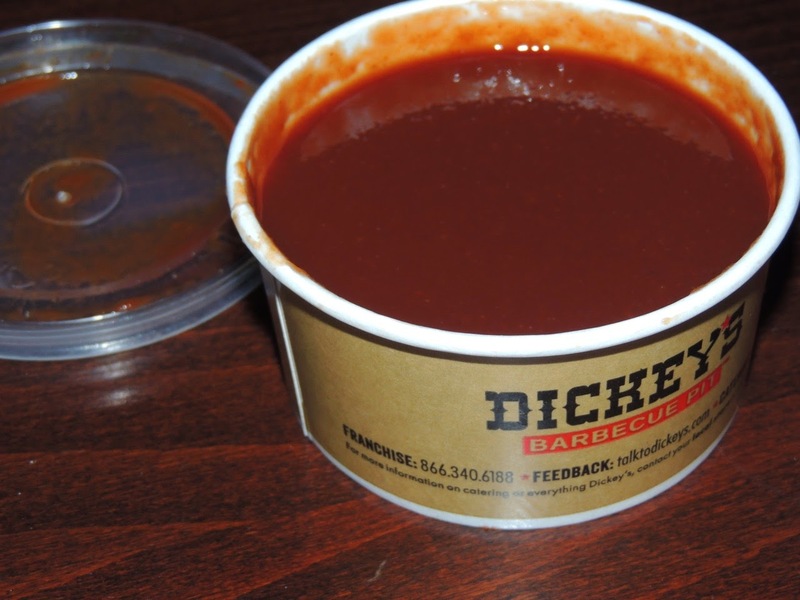 First up is Dickey’s Barbecue Pit. 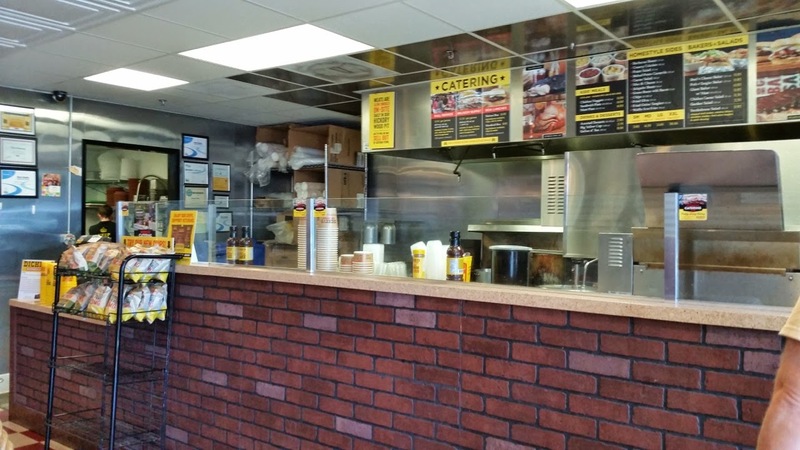 I’ve read that this is a chain out of Dallas, so we hoped it would be some amazing Texas BBQ. My husband bought a LivingSocial deal where he paid $10 for $24 worth of food. 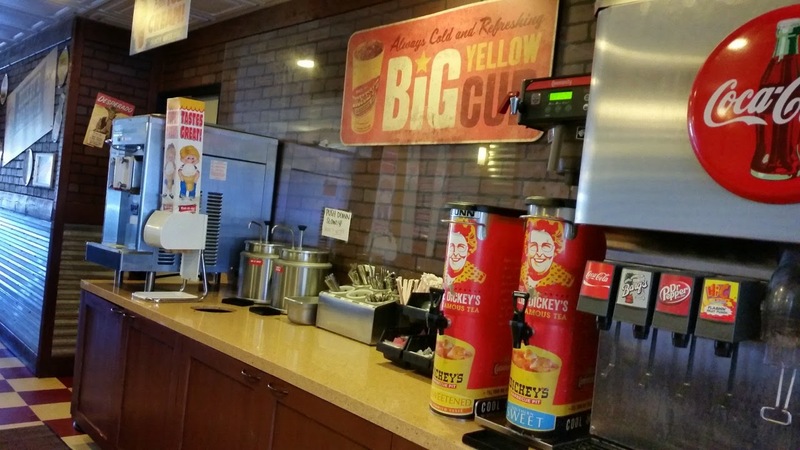 We’ve driven by Dickey’s many times on our way to my mom’s place, but we never thought to stop in. This was the perfect excuse. The place was almost empty when we arrived around 3pm, but there seemed to be a steady stream of customers, most people probably taking the food to go like we were. The guy who waited on us was really friendly and helpful. He told us about the smoked meat and answered all of our questions. We decided to each order a Meat Plate. 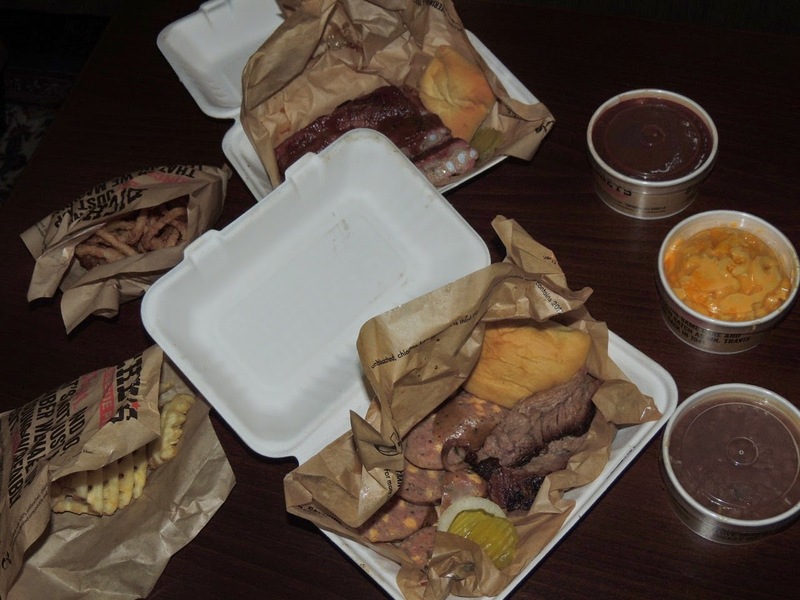 All of the meat plates come with 2 sides, a roll, pickles, onions and barbecue sauce. 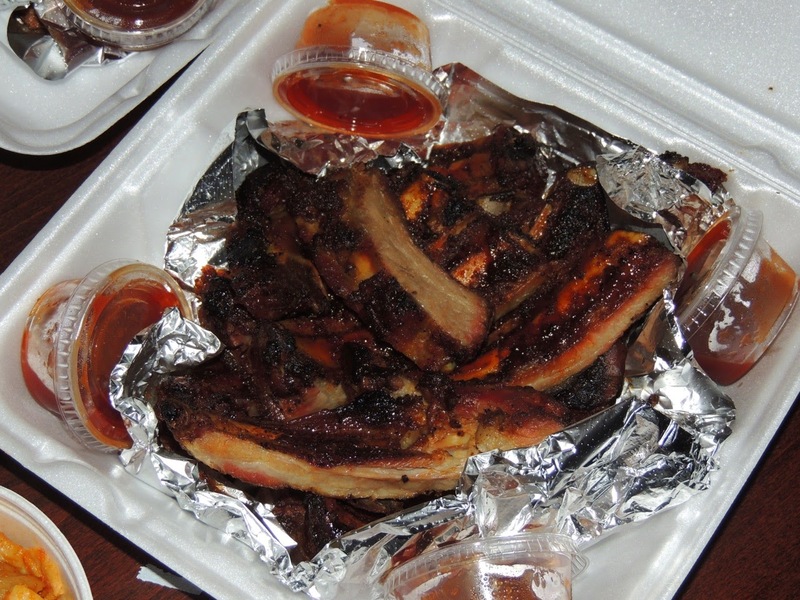 My husband ordered a Rib Plate. He chose mac & cheese and fried onion tanglers for his sides. 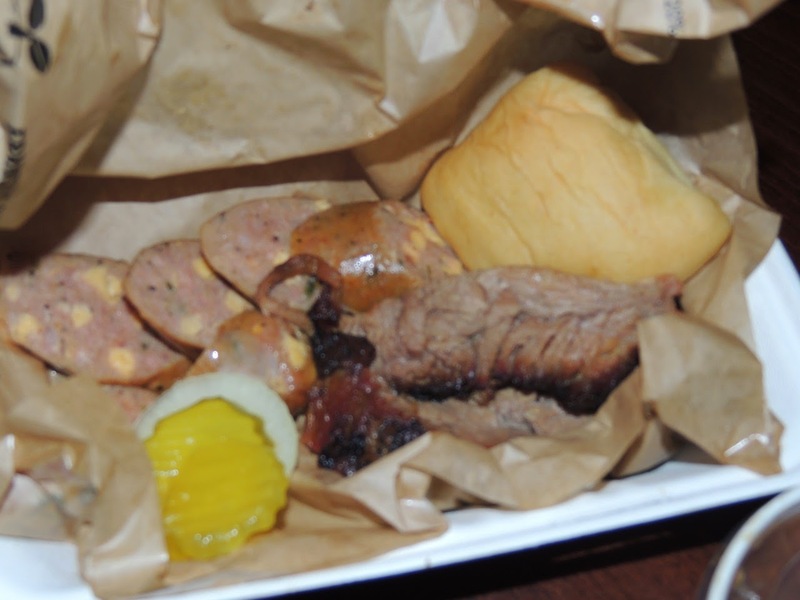 I ordered a 2 Meat Plate and chose beef brisket and the spicy cheddar sausage for the meats. For the sides, I chose barbecue beans and waffle iron fries. The employee seemed happy that we had a LivingSocial voucher to use, probably glad to know that the vouchers are bringing in new business. I had looked up reviews on Yelp and saw that there’s free soft serve ice-cream, so we asked if we could help ourselves to that before we left. We were pointed towards the soft-serve ice-cream machine. It’s not the best soft serve ever (I personally LOVE the vanilla soft-serve at McDonalds. It’s about the only thing I get there. ), but it’s free, so I’m not going to complain. It was just a little too soft and not as creamy as it could be. We ate our ice-cream cones in the restaurant so they wouldn’t melt on our way to the car. I looked around a little while we were there. 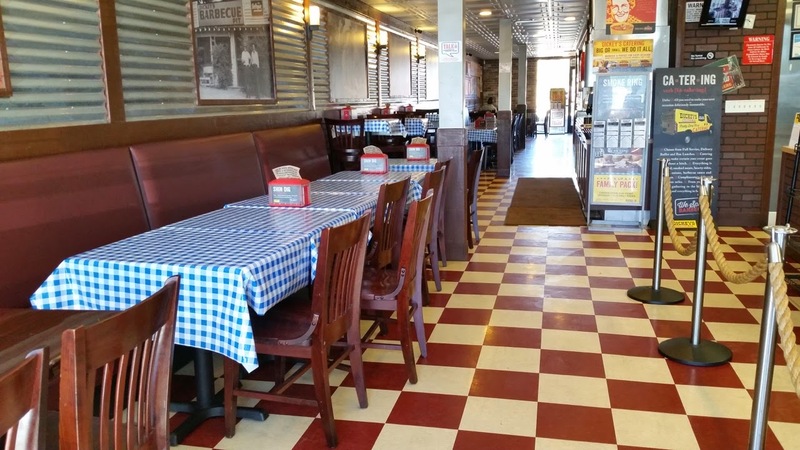 The restaurant seems very clean, and I like the décor; it definitely fits the type of food. We took our big bag full of food home and spread everything out on the table to share. The spicy cheddar sausage was my favorite meat. It was actually amazing. I would totally order that again. 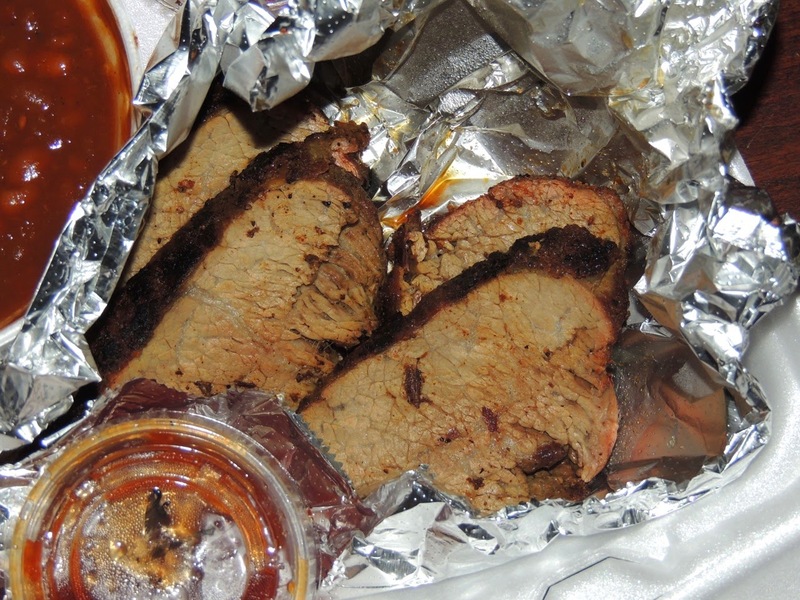 I really wanted to like the brisket, but it was too fatty for me. 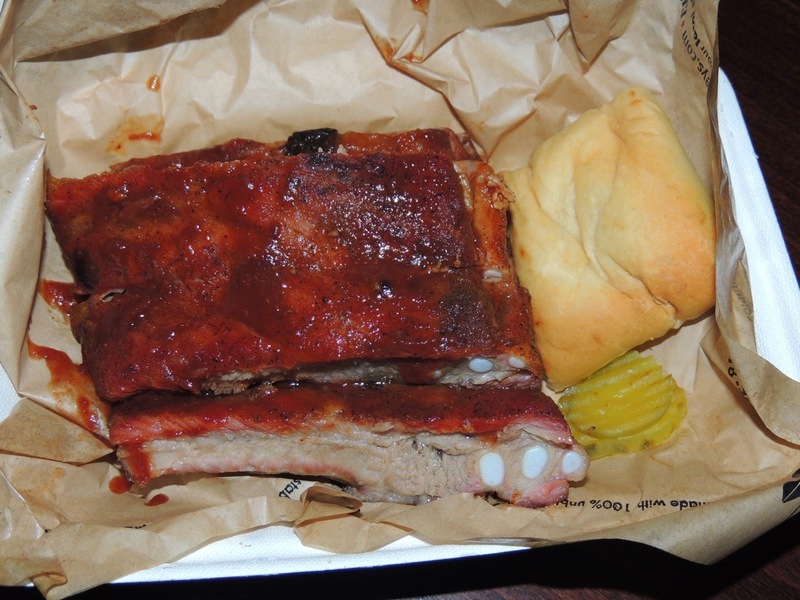 The ribs were pretty good, but I’m not a huge fan of ribs. Of the sides, I liked the mac & cheese the best. 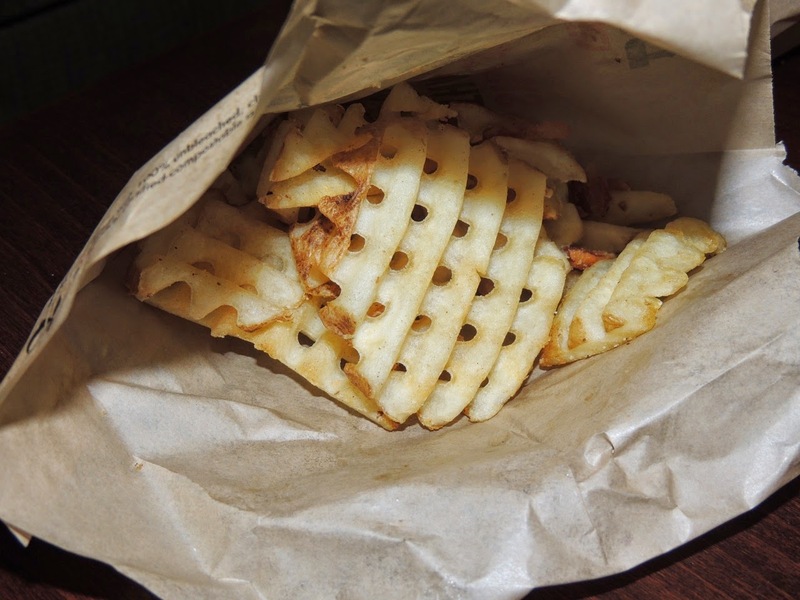 The waffle fries at Chick-fil-a are better. 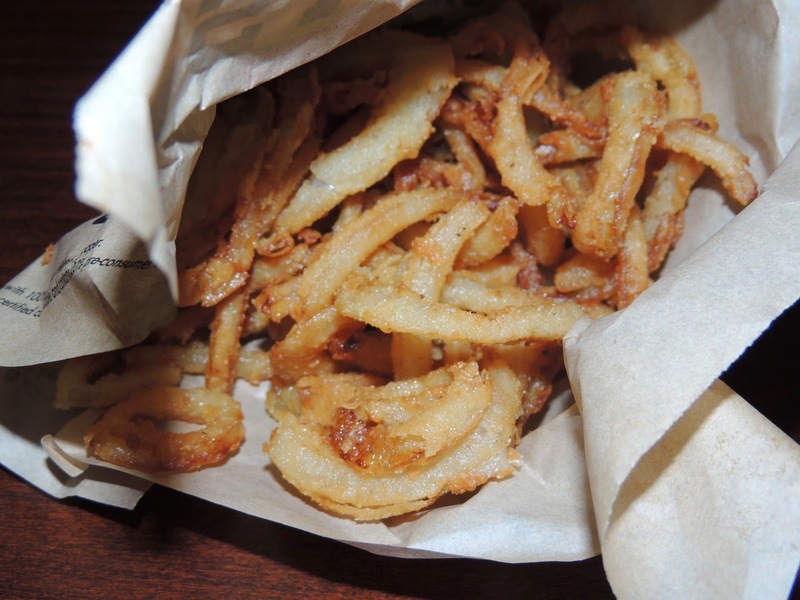 The onion tanglers are good but pure grease. It’s what you’d expect; I’m just not a huge fan of pure grease. The barbecue beans were good, but I’ve had better. The dinner roll isn’t anything special, but it’s soft and good for sopping up BBQ sauce, which, by the way, was good as well. I don’t like super sweet BBQ sauce (my favorite is just Hunts Original), but this was enjoyable. 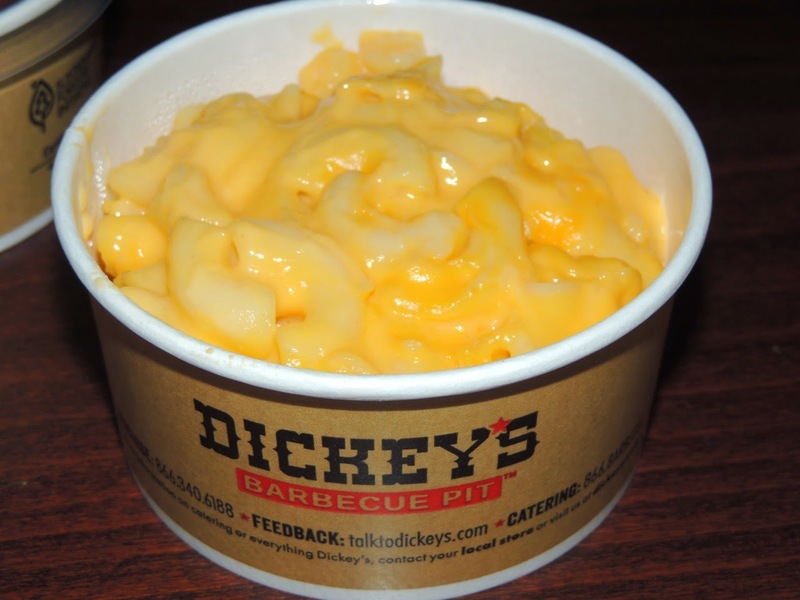 In short, if I went to Dickey’s again, I’d probably get the spicy cheddar sausage and the mac & cheese. Yum! Now, onto Outdoor Grill. One of our friends gifted us an LA Bite voucher, and we used it to order dinner from Outdoor Grill last night. I’ve never eaten there, and I’m not even sure where it’s located. Just a minute; let me Google that. I guess there are two locations, but I’m sure the one we ordered from was the Northridge location. 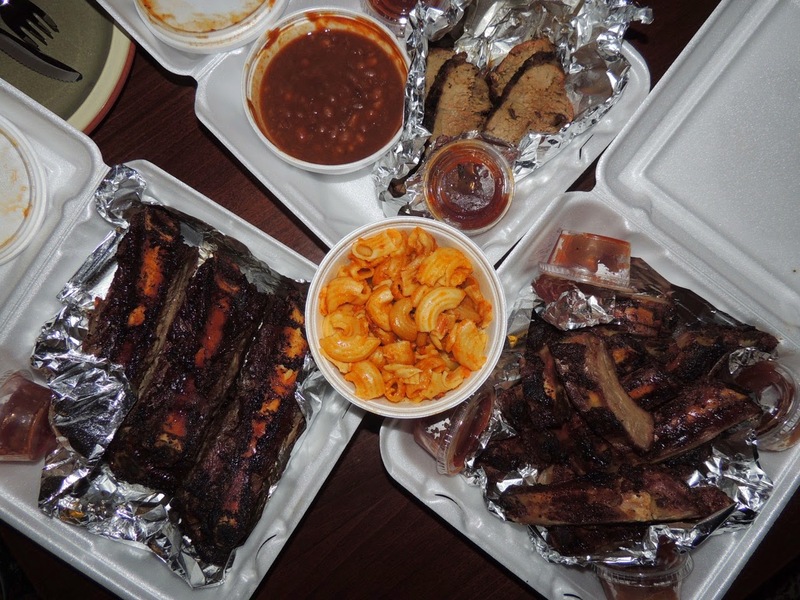 We ordered a bunch of food: a tri-tip plate with baked beans and spicy BBQ sauce, a full rack of baby back ribs with mac & cheese and spicy BBQ sauce, and an a la carte order of beef ribs and regular BBQ sauce. LA Bite said it would be delivered within an hour, and it was actually delivered in about a half-hour. We were definitely pleased with the quick turnaround. My husband answered the door, and he said the delivery guy was friendly and dressed professionally. So, kudos LA Bite. I’ve had food delivered from LA Bite at different places where I worked, but this was my first experience actually having food delivered at home. It’s super convenient, I must say. Now, back to Outdoor Grill. The tri-tip was hands down my favorite meat. It was really good. Mmm, tri-tip! It was juicy, not fatty at all, and just had a great flavor. I could definitely eat that again. 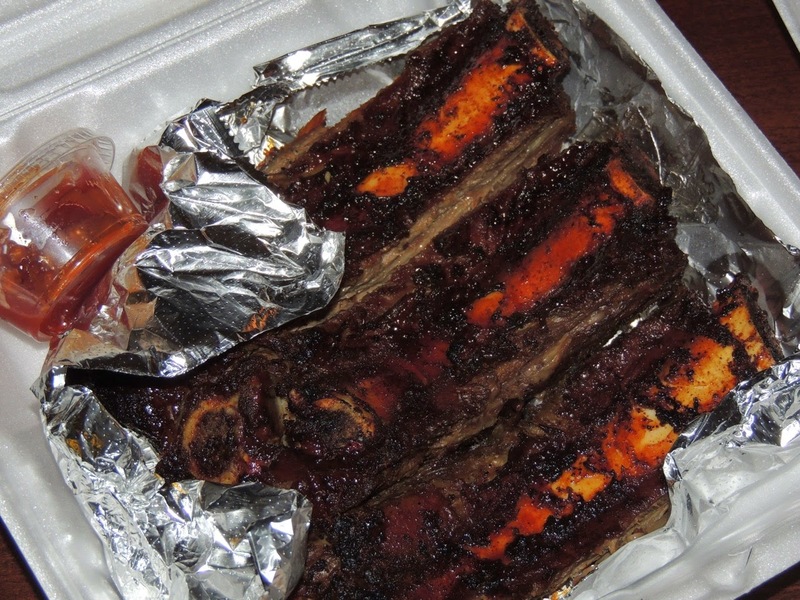 The ribs were very fatty, especially the beef ribs. I know some people love that, but it’s not my thing. My husband ate most of the ribs. He said “ribs are ribs” so he thought they were adequate. He agreed about the tri-tip being amazing though. As far as the sides. 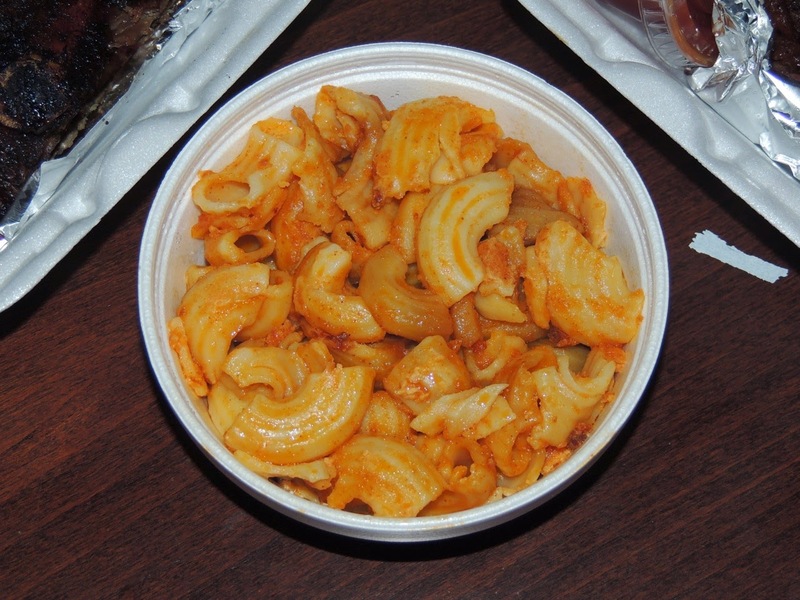 Uh, there was like no cheese on the mac & cheese. It was basically just noodles. So not impressed. The beans weren’t very good either. 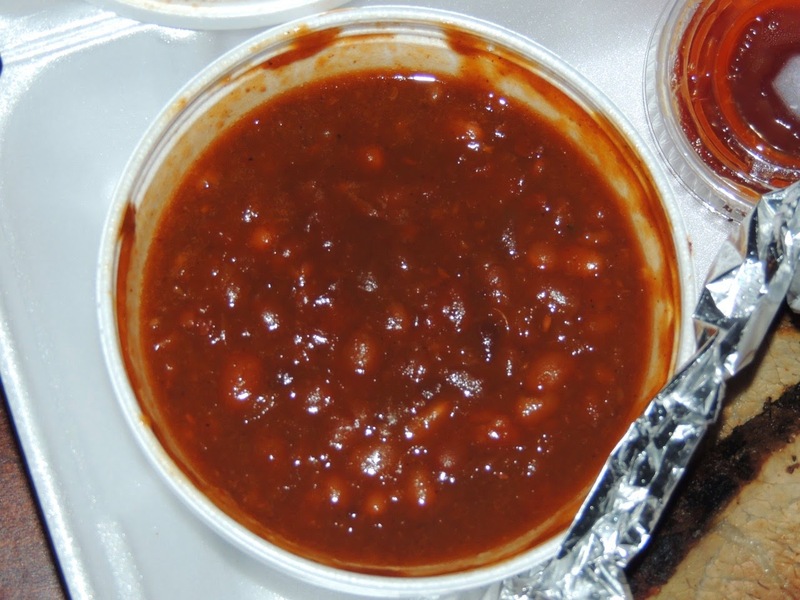 I hated both of the barbecue sauces (the spicy and regular), so that’s probably why I didn’t like the beans (since I assume that same sauce is mixed into the beans). So, if I had to eat at Outdoor Grill again I’d definitely order the tri-tip. I’d have to try a different side, because I wouldn’t get the beans or mac & cheese again. 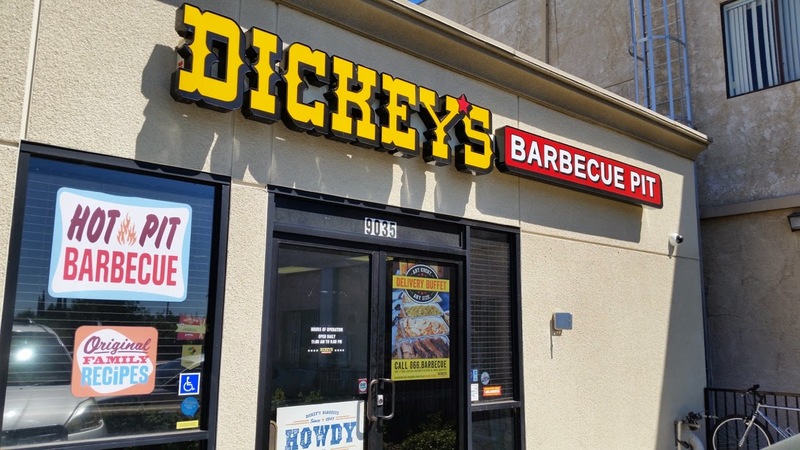 Between Dickey’s and Outdoor Grill, I’d definitely prefer Dickey’s. The BBQ sauce was tasty, the soft-serve was free, and all of the meat and sides were adequate. 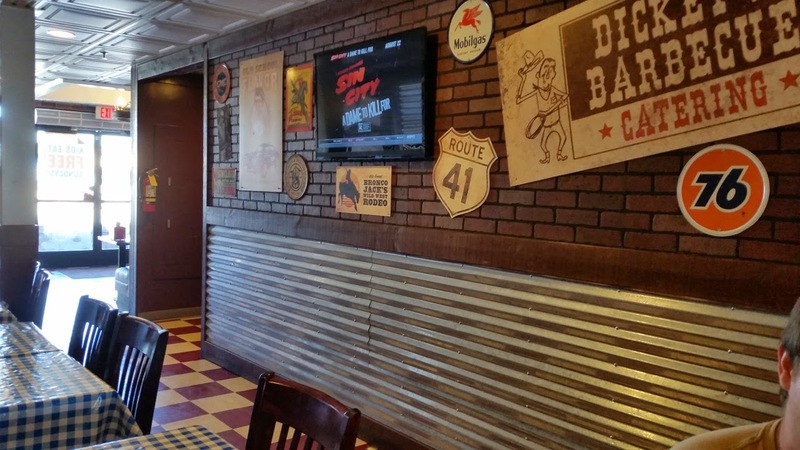 So, did we find a new authentic Texas BBQ joint in L.A.? No. So far the most authentic is still making it at home. 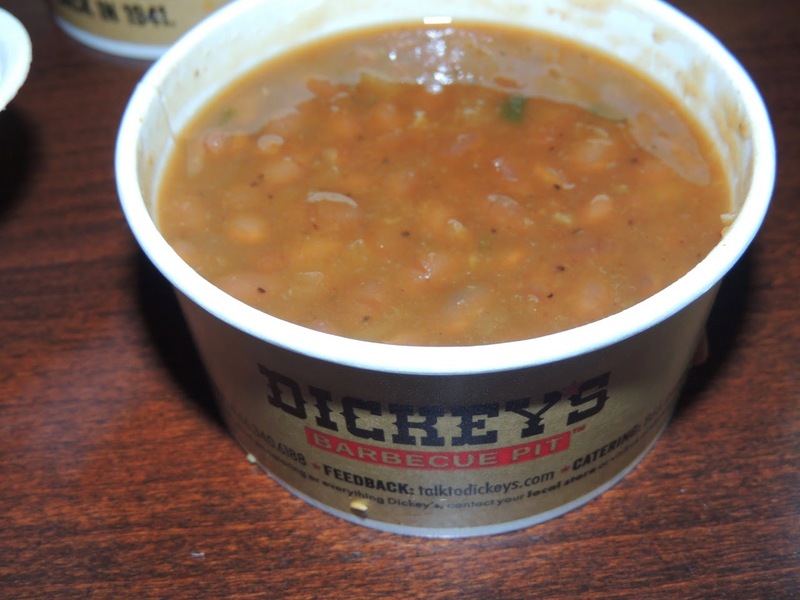 And, I’m sure Dickey’s is based out of Dallas, but my favorite BBQ place in Texas is Pappas, ad Dickey’s doesn’t come close to being as good as Pappas. Just sayin’.